DURHAM, N.H. – As the saying goes, everything old is new again. While the common phrase often refers to fashion, design, or technology, scientists at the University of New Hampshire have found there is some truth to this mantra even when it comes to research. Revisiting some older data, the researchers discovered new information about the shape of coronal mass ejections (CMEs) – large-scale eruptions of plasma and magnetic field from the sun – that could one day help protect satellites in space as well as the electrical grid on Earth. "Since the late 1970s, coronal mass ejections have been assumed to resemble a large Slinky – one of those spring toys – with both ends anchored at the sun, even when they reach Earth about one to three days after they erupt," said Noe Lugaz, research associate professor in the UNH Space Science Center. "But our research suggests their shapes are possibly different." "Because they are usually so close to one another, very few people compare the data from both Wind and ACE," said Lugaz. "But 15 years ago, they were apart and in the right place for us to go back and notice the difference in measurements, and the differences became larger with increasing separations, making us question the Slinky shape." 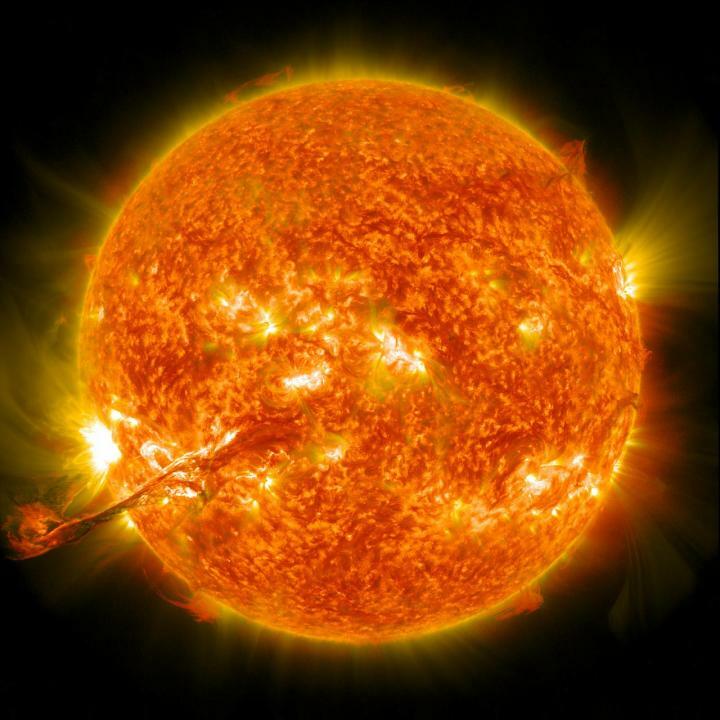 Caption: An image from NASA Solar Dynamics Observatory (SDO) satellite that shows an example of a commonly believed Slinky-like shaped coronal mass ejection (CME) — in this case a long filament of solar material hovering in the sun's atmosphere, or corona. This CME traveled 900 miles per second connecting with Earth's magnetic environment and causing aurora to appear four days later on September 3, 2012.